The Maisha Matters program empowers Tanzanian families to care for their children. We provide life saving milk support and partner with families to assist them in long-term, sustainable success. In April 2016, Neema House Geita partnered with Forever Angels Baby Home in Mwanza, Tanzania to implement their evidence-based Maisha Matters Program in Geita Region. Maisha Matters was implemented with the goal of serving at-risk, starving babies whose mothers have died in childbirth or are too sick with HIV that they are not producing milk to sustain their child. Previously, children in these circumstances were placed at Neema House on a temporary basis to help ensure the children’s health when it was felt that the circumstances were life threatening or the family had no other options. However, our desire to keep children out of institutional care by helping their families to raise them in their own communities. The Maisha Matters program allows us to support children suffering from severe malnutrition while also empowering their families to care for them at home. We start by providing infant milk formula for the baby on a weekly basis and train the caregiver on hygienic milk preparation to combat the risk of malnutrition. If a child is older than a year but suffering from severe malnutrition, we offer support in the form of powdered milk and peanut butter. We work with families to teach or improve basic life skills, including advising families about: business techniques, financial matters, child care, and improved farming techniques. We educate caregivers on issues regarding nutrition; health; basic first aid; the importance of clean water, hygiene & sanitation; and child development, including information about children with disabilities, as well as maternal health. We also support families with other health referrals & resources and mosquito nets if needed. Families come to Neema House weekly to receive formula and trainings. We weight children every week to ensure they are gaining weight and monitor their ongoing health. We also try to complete one home visit after the family has completed the program. Sometimes malnutrition co-exists with other health conditions that have either contributed to (i.e., cleft palate, tuberculosis) or resulted from (i.e., liver damage) the malnutrition. In these instances, we work with the family and consult with doctors to help address these additional concerns holistically. When families lack financial resources to care for their children, we counsel them with business planning, supplies, or skills training so they can run a small sustainable business to provide for their whole family on a consistent, long-term basis. At times, Neema House assists in the purchase of the initial capital for the new business, for which they must pay back 50% of the invested amount. At other times, the family will be provided with a resource, such as a bag of clothes, to sell then use to purchase supplies themselves. If a family has sufficient resources at home that are going unused (i.e. livestock), the family will be counseled about how they can better use their current resources to improve their financial situation. In all situations, we seek to empower rather than enable families. Baby Mariam was referred to us for support through Maisha Matters after being hospitalized for severe malnutrition. Mariam’s father had three wives, and her mother had disappeared with over a year earlier. When she returned, Mariam was so ill that she could not lift her head. Her mother then left the home again, but another wife, Pendo, agreed to care for Mariam and began bringing her to weekly Maisha Matters training. Within 6 weeks, Mariam had gained 4 kgs (8.8 lbs). Pendo had some previous training to be a seamstress but had not ever finished her course. Neema House helped pay for three months of training so that she could then open her own business to help support herself and Mariam. 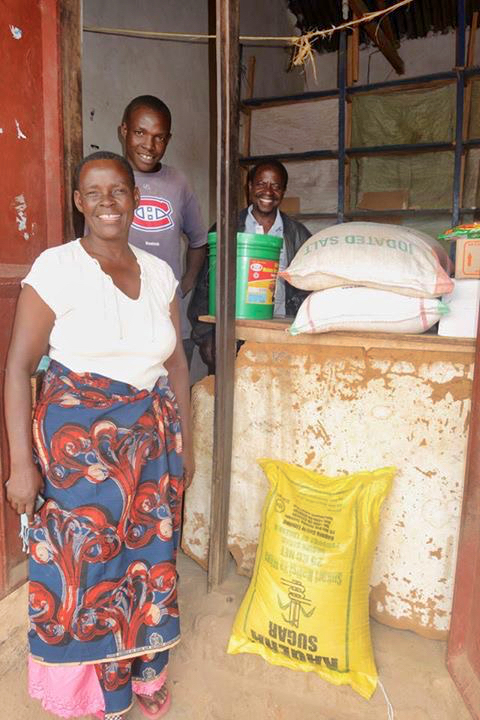 Since then, Pendo has repaid the entire cost of her training and started her own business. Mariam continues to be healthy and happy at home with her father and Pendo! Greyson (age 1 year, 8 months) was referred to Maisha Matters by Geita Regional Hospital for concerns of severe malnutrition. At the time he weighed 5.97 kgs (13.1 lbs). After working with him closely for a couple of weeks, Neema House staff recognized possible signs of TB and took him to the clinic for testing and medication. 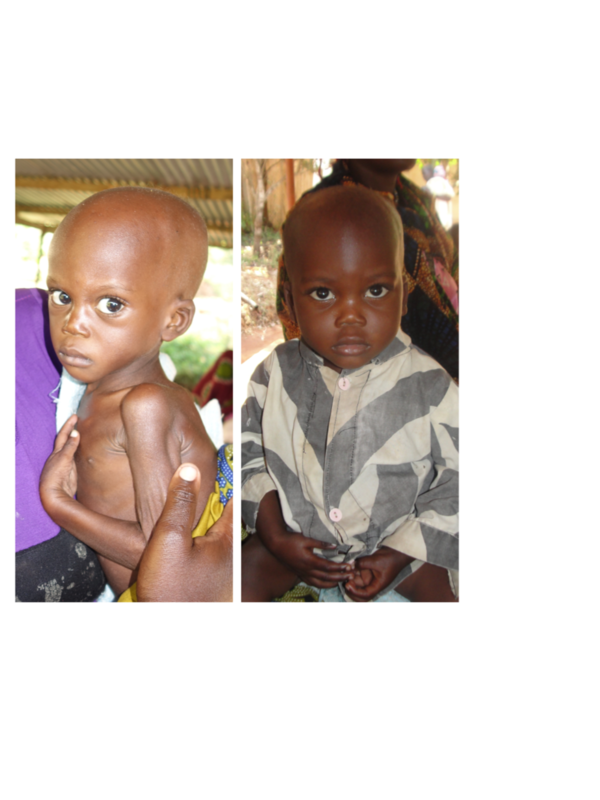 Within 6 weeks of treatment and nutritional support, Greyson had gained 3 kgs (6.6 lbs). He has now regained strength to sit and play and has even begun walking and catching up on other developmental skills.